Fourteen year old nerd-boy Dan Cereill is not quite coping with a reversal of family fortune, moving house, new school hell, a mother with a failing wedding cake business, a just-out gay dad, and an impossible crush on Estelle, the girl next door. His life is a mess, but for now he's narrowed it down to just six impossible things... Goodreads. Teendom is all about life transitions whether emotional, physical, hormonal or situational and Wood plays this with subtle grace. Dan's got a sensitive soul buried beneath his outward frustration and it shines through beautifully. There aren't enough stories about teen boys and their mothers and Six Impossible Things finds itself added with Boofheads (Mo Johnson) for it's authentic, pithy and always heartfelt depiction of this essential relationship. Both Dan and his mother were terribly hurt by there family's dissolution but he's trying to move one while she's left sabotaging her grieving process on several levels. Dan's socially awkward in the best way possible - smart, completely unaware of his appearance and unable to stop staring at the object of his admiration. He's completely frank about his deficiencies in high school as he teeters between moments of maturity and the expected bouts of teen hysteria. Wood has crafted a beautifully realised sphere of characters that colour Dan's experiences with humour, truth, bloodshed and the occasional leg up. There's a depth here that makes Six Impossible Things feel substantially longer than the two hundred and forty-four pages would suggest. Dan's such a good kids but that never stops him from being interesting. In fact, it was refreshing to revel in a story about a kid that makes the occasional poor decision but it ultimately a caring individual with a good, strong head on his shoulders. It is Dan's honesty that really grabbed me. He can't help but note his shortcomings even in the midst of a snotty retort to his mother and that level of self awareness was the source of great humour and even greater relatability. 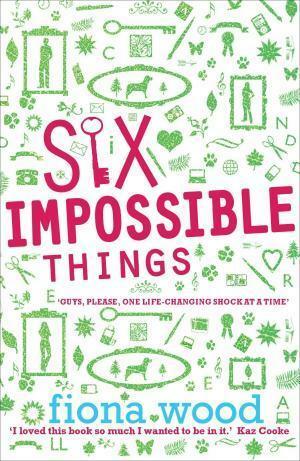 What struck me the most about Six Impossible Things were Dan's moments of clarity in the somersaulting amongst his unhinged home life and swirling emotions. He (and by extension Wood) know what is important. Family, friends and a good sense of humour and this book has plenty of all three. Highly recommended. A truly impressive debut. wow, amazing review Adele. To be frank, i haven't heard much about this book and i went into reading this review knowing little about the book or the author, but you have crafted a review that makes me want to pick it up on your recommendation alone. Which i suppose is kind of fantastic. Plus, I love it when books don't focus too much on the semantics of high school popularity, because thats not representative of real life. Maybe it's because i had a different high school life compared to the ones in books and films, but it seems like a refreshing change to read about a character that just wants to be accepeted and not just climb the social ladder. AND you said it was funny. SOLD. Wonderful review - as always! This is really random, but I'm wondering if the title is at all in reference to that line from Alice in Wonderland where the Queen says "Why, sometimes I've believed as many as six impossible things before breakfast."?? Out of the blue, I know. I'm just curious now.